We offer all private rooms with en suite bathrooms for comfort and privacy. Green Village provides a full continuum of care, from short-term rehabilitation, post-surgery recovery, long-term skilled nursing, to hospice care. We measure our success by our patients’ success. Every completed step brings our residents closer to returning to restored health and functional independence. 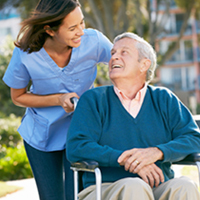 At Green Village, we strive to make each individual’s day in our care as safe and comfortable as possible, while providing the very best services in a range of individualized and specialty programs, and complex clinical services. Our staff knows that selecting the right facility that can meet your healthcare needs is crucial to gaining your independence back. To ensure that we’re delivering the very best care, we believe open communication and partnership is important with our patients and their loved ones. We include you in every step of the planning process. This will keep us moving forward on your path to comfort, independence and recovery.